In elbow bursitis, the bursa fills with fluid, causing pain and limiting movement. Reproduced and modified from The Body Almanac. (c) American Academy of Orthopaedic Surgeons, 2003. Prolonged pressure: Leaning on the tip of the elbow for long periods of time on hard surfaces, such as a tabletop, may cause the bursa to swell. Typically, this type of bursitis develops over several months. People in certain occupations are especially vulnerable, particularly plumbers or heating and air conditioning technicians who have to crawl on their knees in tight spaces and lean on their elbows. Infection: If an injury at the tip of the elbow breaks the skin, such as an insect bite, scrape, or puncture wound, bacteria may get inside the bursa sac and cause an infection. 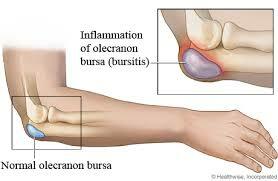 The infected bursa produces fluid, redness, swelling, and pain. If the infection goes untreated, the fluid may turn to pus. Occasionally, the bursa sac may become infected without an obvious injury to the skin.